Regardless of the grade level the individual is teaching, patience is essential in the classroom. Inevitably, the educator will run into students who struggle, misbehave, or require extra attention for other reasons. They must remain calm and continue to work with these children so that they find success in school. Of course teachers must be able to communicate with their students properly, but truly successful educators are also able to work well with administrators, other teachers, and all staff members working in that school. Additionally, they’re able to communicate with their students’ parents or guardians to explain how the child is doing in class. Teaching is challenging, to say the least. The best teachers have a genuine enthusiasm for the field. They truly believe in what they do and why they do it. Those who teach because they aren’t sure what else they’d rather be doing will quickly find that they end up burnt out and counting down the days until summer rolls around. Education changes quickly. You may teach students a particular subject a certain way one year, only to find that your administrators would like you to teach it another way the following year. The best teachers are able to be flexible and adapt to these changes, without getting flustered or frustrated. They also incorporate changing technology trends into their classroom, and stay on top of developments in the educational field. Inevitably, you’ll want your younger teachers to get regular feedback from the veterans on staff. However, if the newer teacher regularly gets offended by this feedback, eventually this is going to cause tension among your team. The ideal new hire will be able to take some criticism and learn from it, rather than feeling offended. 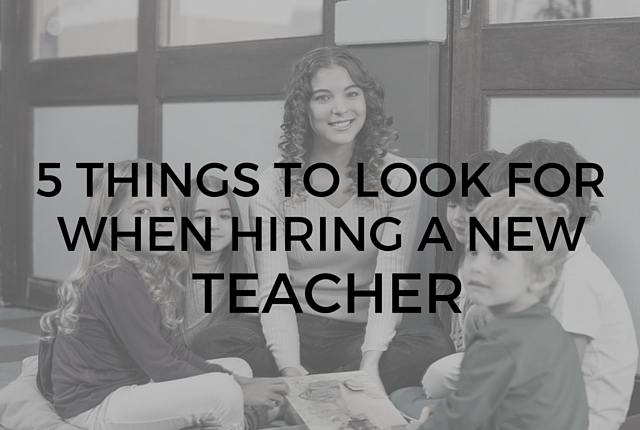 What do you look for when you’re hiring a new teacher? Share with us in the comments!